It's Monday morning, bright and early, and I'm meeting up with Julia and Rick Goldsmith from Catcher Media. So, what's on the cards today? 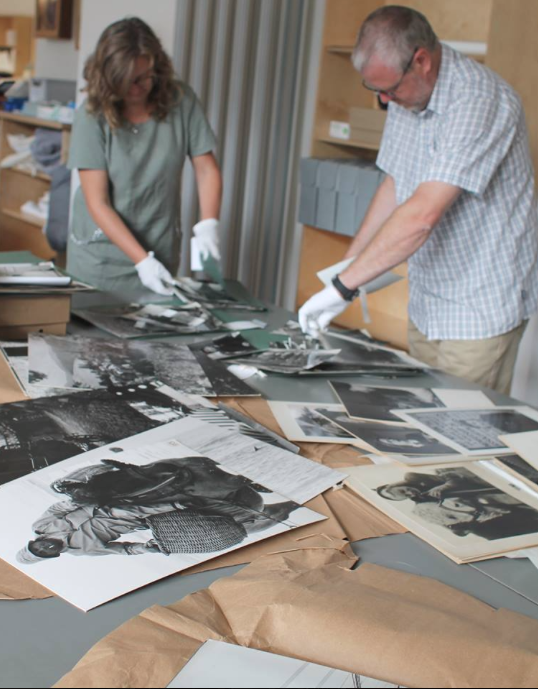 We are on our way to the HARC center, Hereford, to browse through the archive material from the Derek Evan's Photographic Studio 1950's – 1980's. The plan is to capture some film footage and meet up with 3 former colleagues of his, Keith James, Graham Essenhigh and Jennifer Bowen. Yes! Well, this already sounds fabulous. 'Herefordshire Life Through A Lens' is a heritage project lead by the award winning team Catcher Media, centred around the photography of celebrated Herefordshire photographer Derek Evans. What better setting for today's filming than that of the HARC centre located in Rotherwas. Fresh and modern, built for purpose, with large windows affording masses of daylight, it's a space with a soothing and restful ambience, a great place to take a moment, reflect and make a study of times gone by. This morning we are also joined by Cameron Mundell, a fellow volunteer, and a student of photography, who recently completed his A levels at Hereford Sixth Form College. He is full of enthusiasm and ideas and proves to be excellent company on this exciting day. Of course, it goes without saying that we can always rely on the Rick and Julia to construct a relaxed and positive working environment. All set up, equipment in place, the shoot begins. Assisted by Rhys Griffith Manager at HARC, the studio collection is wheeled out, parcel after parcel stacked at the table, image after image unveiled. A series of captivating black & whites of local events and people as a pictorial lesson in social history; images of the Mayfair dancers and dodgems, the Fownhope Flower walk, characterful bands of labourers out in the hops field, wonderfully carefree children, golden moments in football, the glamourous Miss Hereford, inspired musicians and singers, and even Royalty - it's all here photographed with warmth and sensitivity, not to mention a definite element of humour thrown in for good measure. The collection is vast and aside from the prints there are hundreds of film negatives, a large number of log books and an assortment of magazines editions featuring Derek's work. What's really special is that all three of our guests are able to provide a commentary of anecdotal chit chat as we leaf our way through. With the collection before us, and with my own camera to hand, I am able to grab a few shots. It occurs to me that there is something fascinating in taking a photograph of a photograph, capturing an image within an image. Each one of Derek's images so striking in it's own right, telling it's own story, when photographed within a modern context, in turn creates another story, an interaction between past and present. We focus for a moment on a shot featuring a policeman holding back a crowd, small children peering around his legs. It's a moment in time, caught by chance. “Derek always used to say, once you have chosen and taken your shot you should then take a minute to look over your shoulder,”, says Keith, the implication being that there is often an equally interesting shot where you least expect it. Useful tip. 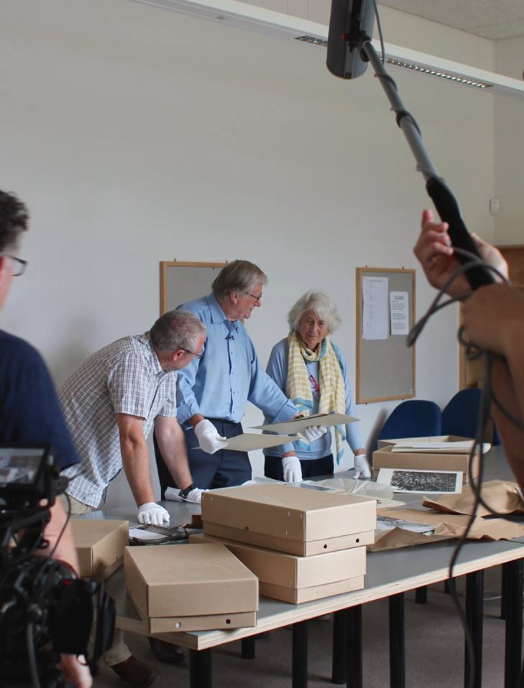 It's worth pointing out that it is Keith, Derek's former business partner, who recently kindly donated the studio collection to the archive centre. It's thanks to him that the material is now available to all. Graham currently runs a successful broadcasting business called Bubble Production and during lunch over plums fresh from the Goldsmith's garden, reminisces about his time at the studio and how things have changed over the years. Cameron and I have been busy snapping away all morning with our DSLR cameras whilst Graham, although only in his 50's, remembers well shooting on film and having a very limited number of frames available and allocated to any one event. “For instance,” he says, “you might go out to photograph a party with only 12 frames”. You would certainly need to choose your shots wisely. “Jennifer took this one”, says Keith. He is referring to the iconic photograph of Derek looking to camera with his own camera in his hands. Keith has also brought from home a framed print of another of Jennifer's photographs to show us. It's a stunning portrait of a young boy who is situated to the right of the frame dressed in outsized corduroy shorts held up with string, hands in pockets, a dirty face and ragged little shoes. He looks sullenly into the distance. Jennifer is clearly a very talented photograper herself athough modestly brushes off the attention. The day is almost at an end. Throughout, Rick has been filming events, myself and Cameron alternately handling the boom. 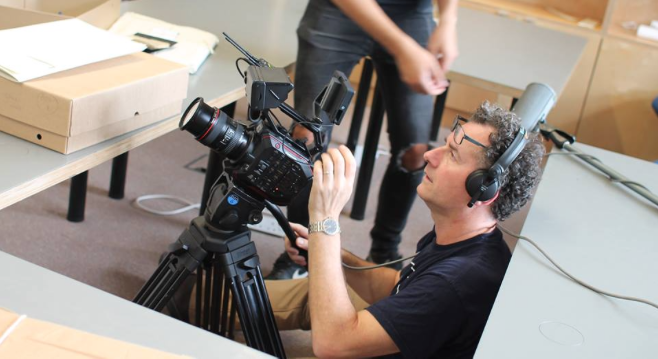 As someone interested in film making I have attended a number of shoots usually as an actress, occassionally as crew and similarly our guests seem very comfortable in front of camera, obviously with previous experience and a working knowledge of this kind of environment. However, as someone new to film, Rhys manager of HARC, is most certainly the star of the show today! Calm, collected, responsive to direction and completely natural. Well done Rhys! Thought of hiring an agent? All in all, an enjoyable day had by all. A day spent delving into the past. Definitely worth booking a day’s leave from my office job to spend a day’s holiday volunteering with Catcher Media!